No Game Master can ever have too many colourful characters to throw at her players, whether they're friendly allies of devious enemies. The Inner Sea NPC Codex presents over 50 unique NPCs from the Pathfinder campaign setting, allowing GMs to focus on the story they want to tell and not the statistics for the assassins, cultists, cabalists, and other characters their players may meet along the way. Each entry provides not only all the mechanics needed to run the character in both combat or social encounters, but also an overview of how that character fits into the world of the Pathfinder Roleplaying Game. Knights: From the valiant Knights of Ozem to the chaos-smitting Hellknights and the regimented soldiers of Molthune's army, this book contains no shortage of knights and soldiers for any war-torn campaign. Jacks-of-All-Trades: From Aspis Consortium spies to Pathfinder chroniclers to Sleepless detectives, the skilled characters found within can serve equally well as allies or enemies, depending on the GM's needs. Mystics: While the goodly Magaambya arcanists stand in opposition to the sinister Blood Lords of Geb and the druids of Uskwood, all three mystical spellcasters, as well as many more from a variety of traditions, can be found together in these pages. Scoundrels: Whether it's an assassin from the mysterious Anaphexia or the murder-cult known as the Red Mantis, or a fanatical agent of the Infernal House of Thrune, find the right hoodlum for your game here. 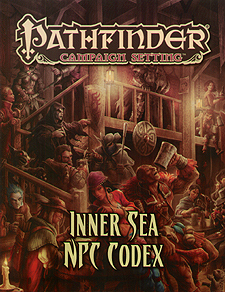 Inner Sea NPC Codex is intended for use with the Pathfinder Roleplaying Game and the Pathfinder campaign setting, but can easily be used in any fantasy game.